Why they got their feet bound. Women got their feet bound so they could get married. If you got your feet bound you didn't have to do any manual labor. You were also higher class if you got your feet bound. Women got their feet bound for more reasons then I can come up wit but theese are the main reasons. How they got their feet bound. They got their feet bound when they were just little girls because their bones were still soft. 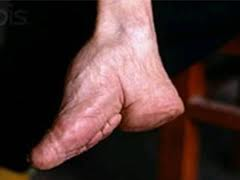 They would warp their feet so tight that it would start to break thier toe bones and bend the top of thier feet. They had to keep it warped for a really long time. They also had to cut the toe nails every day so it wouldnt tare the toe. Women who were pretty wealthy got thier feet bound. It meant that you were higher class and you didnt really work like the slaves would. The wealthy men would marry a women with her feet bound. It was thought that if you had small feet that you were able to marry.